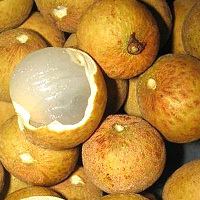 Longan is a dried fruit found in Southeast Asia produced in the Southern region of China. It is rich in water soluble dietary fiber, vitamin B2, potassium, and copper. It is also used in traditional Chinese medicinal practice. On top of eating raw as is, it can be used to make cake. The calories in Longan per 10g(1item) is 28 calories. Longan is calculated to be 283Cal per 100 grams making 80Cal equivalent to 28.27g with 7.29g of mostly carbohydrates、0.51g of protein、0.04g of fat in 10g while being rich in vitamins and minerals such as Copper and Vitamin B2.